When we prioritize our spiritual practices and align our thoughts, actions, and choices with our purpose our lives changes. Before I made the commitment to my spiritual practices I noticed that I would feel really connected to myself, my intuition, my truth, and the universe on the days I did my practices. On the days that I did not, I noticed that I didn’t feel so connected, I experienced more negative self-talk, I had a less positive outlook, and I was less motivated to get things done. For a while, I totally abandoned my spiritual practices. I let myself make excuses and as a result, I felt further and further away from my self, my truth, my purpose, and the universe. It was an extremely difficult time in my life. I was dealing with health issues, the loss of a business I had been dreaming of for years, and I had forgotten how important and impactful my spiritual practices were. Luckily, this phase of my life did not last long. 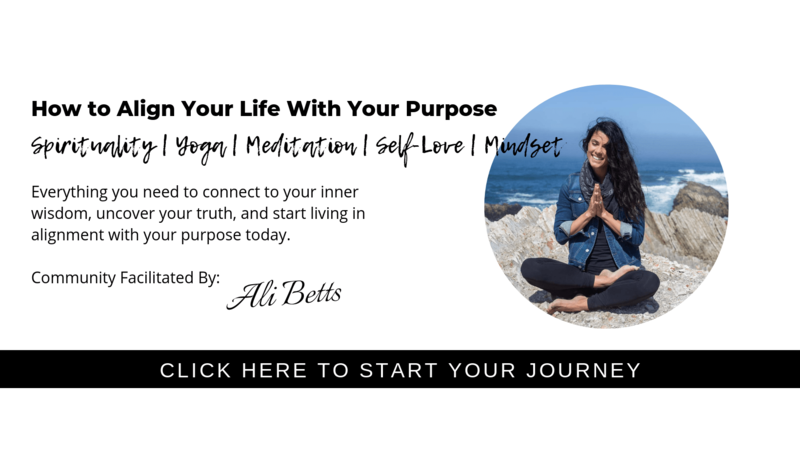 I had a moment of clarity and connection and remembered all of the amazing practices that helped me feel connected and aligned with my purpose. I am grateful for my experience because now I have context and know how I feel when I am not doing my spiritual practices regularly. I will never make that mistake again. I hope that reading my story and my experiences will inspire you to commit to yourself, your journey, and your spiritual practices. When you commit to your spiritual practices your connection to yourself and your intuition is strengthened. As a result of taking time to be still, to practice gratitude, and making time for things that nourish your soul your intuition increases. It is hard for your intuition to compete with all the chatter of a mind that never stops. Your practices help quiet your mind and your intuition gets louder. It takes notice of the work you are putting in and does everything it can to help and support you. Happiness is a natural side effect of prioritizing spiritual growth. Connecting to your truth, inner wisdom and then taking action to align your life with those things will bring you happiness. You will feel more alive, fulfilled, and vibrant. When I let my life get in the way of my spiritual practices and growth, this was when I struggled the most. There were days I didn’t want to get out of bed. I felt lost and had no direction or purpose, I had no motivation. And I didn’t understand why I was struggling so much. Then I had an aha moment. I realized I stopped doing the things that helped me feel connected. My excuses had become stronger than me. 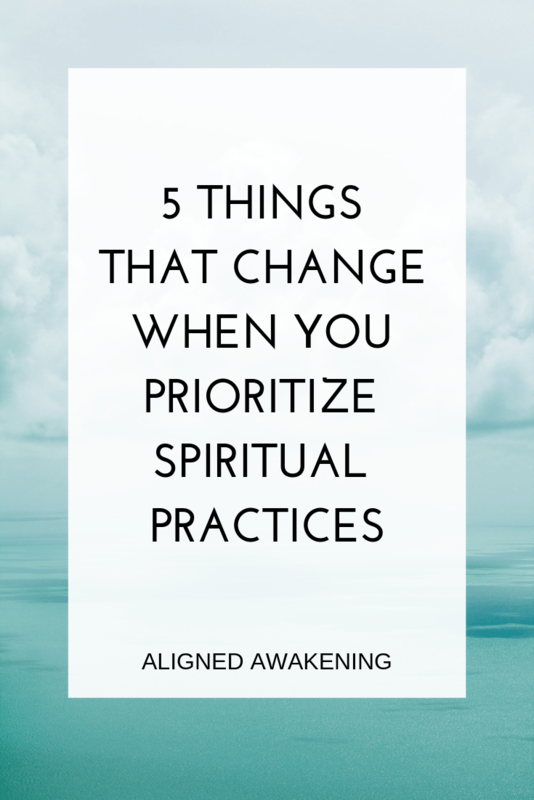 I knew If I wanted to feel better again I had to align my priorities, I had to get back to my spiritual practices. No excuses. The result was nothing short of amazing. I was happy again. I felt connected to my purpose and was excited to be here again. Now I wake up and have a reason to get out of bed. This is not to say that I no longer have challenging days because I do. They just feel much less overwhelming and they don’t throw me off like they use to. I am now much better at feeling the difficult feelings and letting them go now than I was before. Everything you think, speak and do sends messages to the universe. By prioritizing your spiritual practices you are telling the universe you are committed to the evolution of your soul. The universe receives this message and sends you exactly what you need at the time that you need it. When I first committed to my spiritual growth I had just moved and was looking for a new job. It wasn’t a big place so there were not tons of jobs available. At that point in my life, I had a lot of experience, with customer service, retail, and management. I was looking through Craigslist and this ad for a position at a new yoga studio popped up. I got really excited. The universe was guiding me here I could feel it. Even though I had only practiced yoga a few times and didn’t know much about it at all. I knew this was where I was supposed to be. I quickly put together a cover letter and sent them my resume. Shortly after this my phone rang, it was the owner of the studio inviting me in for an interview. When I walked into the studio for the first time it was a feeling of being home. The interview went well and I was hired on the spot. I worked at that studio for a year. I learned so much about myself and yoga. It is where I developed my passion and belief in the transformative power of the eight limb practice. The universe knew that being in that studio was exactly what my soul needed in order to evolve. It lead me there because it knew that I was committed and ready. As a result, my yoga practice grew immensely and my life began to rapidly transform. There is nothing like the power of living in alignment and prioritizing your spiritual practices to skyrocket your ability to manifest your dreams. This is because your commitment is constantly raising your vibration and sending the universe messages that you are evolving and growing. Manifesting is all about creating space for the things you want to have in your life, being grateful for what you do have, and believing you will relieve what you are calling into your life through manifesting. And being committed to our spiritual practices help increase our power to manifest. For a while, I got super into manifesting. It was a skill I really was focused on developing and had a lot of fun with. I had always manifested parking spots wherever I went and wanted to take it to the next level. I wanted to start a yoga studio consulting business. So I got to work manifesting that into my life. Within two days of starting to work on manifesting I had three studios hire me for my services and I also was hired to teach yoga in the inner city at a school. I was blown away at how quickly I was able to call those opportunities into my life. It was truly amazing and the same is possible for you. When you have committed to your journey everything will begin to fall into place. The things that are important to you will be magnified. You will become more and more clear on your purpose, which will help you live a more aligned life. The things that have been distractions or struggles in the past will slowly melt away. This is the power of alignment, devotion, commitment. I have witnessed this in my own life many times. When I decided to commit to healing my past facing my eating disorder wasn’t so scary anymore. I simply made different choices and the universe supported my recovery. When I have worked on projects that were out of alignment with my soul’s purpose they never came to maturity. Which is quite the opposite of when I am working on projects that align with my soul’s purpose. On those projects, everything flows beautifully and I am guided along the way. It is truly amazing. Want support on your spiritual journey? I would love to have you join my free community!